l-1 canaan, originally uploaded by jahansell. 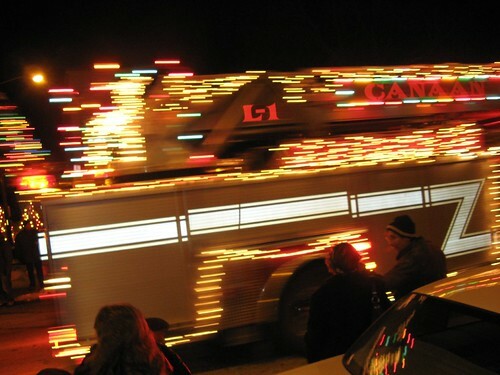 Saturday Night in MIllerton was the annual Parade of Lights - fire trucks, trailers, even campers all decked out within an inch of their lives! I laughed at this one, put on by a local sanitation company - perhaps their Santa has an incontinence problem! What fun! An A for effort to the sanitation company! I mean, at least they tried! LOL. Great pics, wonderful Christmas cheer. I like the way you've gotten that streaking effect! Btw, I get a catalogue from a tea company in your area; we went to their shop several years ago, but they seem to have moved to Millerton. Do you know it? Neat picture, I love the lights.